There’s so many cloud storage services out there, I almost forgot about Amazon. With such a big brand and name you’d only expect great things from an Amazon cloud storage service. Here’s a look at my experience and what you can expect. 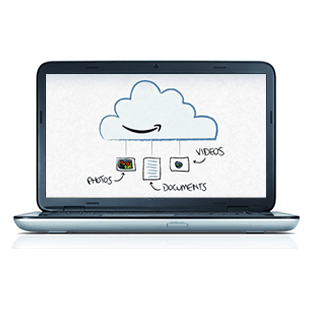 Amazon isn’t one to be left out of the cloud storage wars. Amazon has a less-talked-about cloud storage service that offers 5GB of free space and affordable paid plans. Unlike Dropbox, Amazon doesn’t offer referral incentives or methods for increasing your free storage space. However, Amazon does offer unlimited music storage space if you buy any of the paid plans. To be eligible for unlimited music space, files must be music recordings in MP3 (.mp3) or AAC (.m4a, iTunes non-DRM files) format and must be less than 100 MB in size. All lossless files with the .m4a extension are not eligible for storage in unlimited music space. Files purchased from a digital music store, such as the Amazon MP3 Store, and files imported to your computer from a music CD will often meet these criteria. Files that meet the criteria don’t count against your Cloud Drive storage quota if your storage plan includes unlimited music space. Note: Music recordings in other formats, lossless files, or audio recordings that are not of songs and non-audio files (even if in MP3 or AAC format) are not eligible for unlimited music space and will count against your Cloud Drive storage space. 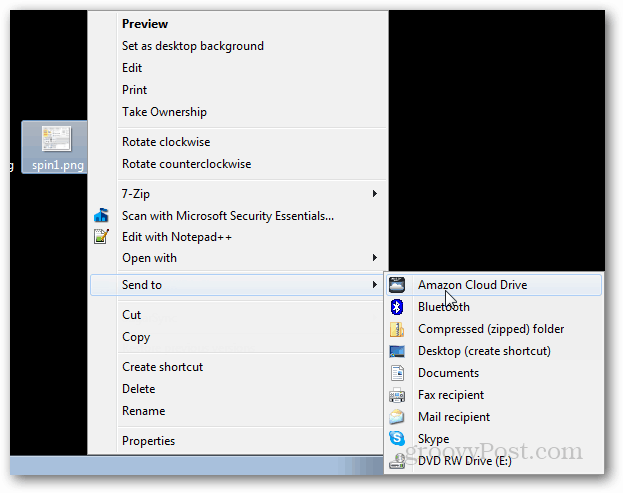 With that said, here’s a look at the actual desktop app fro Amazon Cloud Drive. First off, I noticed right away that the only way to upload files is by right-clicking on them and using the Send To option. Rather than using a Dropbox-like folder, selected files are uploaded directly to Amazon’s server. This is nice for uploading, but it’s inconvenient when you need to remove a file. Removing files you use the web interface in whatever you favorite browser is (Chrome, Firefox, etc…). Uploading is tracked in the system tray menu. I noticed that Amazon had trouble uploading large files, though I’m not sure whether this was because of a hard limit set by Amazon or if it was because of my slow DSL connection speed at the time of testing. 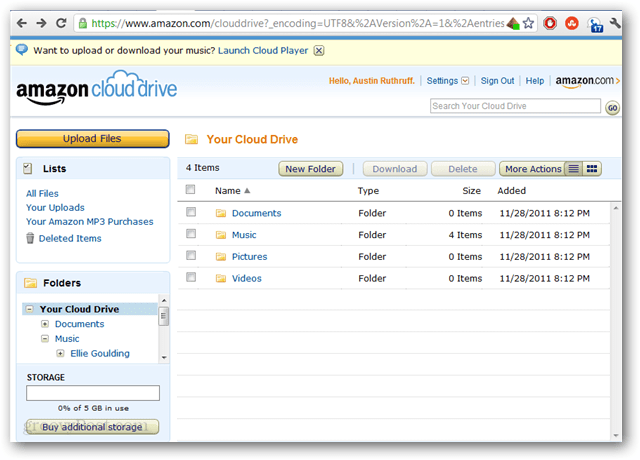 As far as web interfaces go, Amazon Cloud Drive isn’t bad. It offers an expanded tree of all folders. I especially liked that Amazon MP3 purchases are automatically added to a separate folder that doesn’t use up any of your storage quota even if you are on a free account. Setup was also quick and painless. I just downloaded the setup file and clicked install. Done. 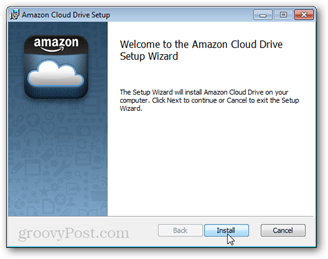 The Cloud Drive service can be set to run on any Amazon account, which makes it especially nice if you have one for downloading a lot of music. 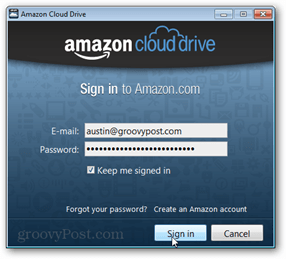 Amazon Cloud Drive provides an easy 5GB of web storage that doesn’t require you keep the files on your computer, which is nice. It also gives you unlimited music storage space if you upgrade to a paid plan. On the other hand it doesn’t have nearly the amount of features found in Dropbox, and it’s doesn’t have any way of sharing files. Unlike CrashPlan, none of the data that is uploaded is encrypted and none of it is automatically updated. 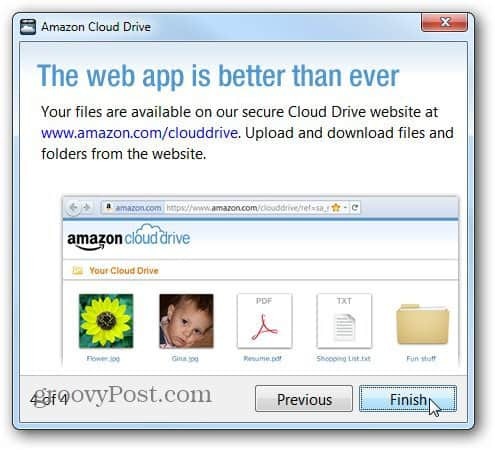 Overall I’d say that Amazon Cloud Drive is a free 5GB web “usb stick” great for quick-access to non-sensitive files. However if you need a serious back-up or collaboration solution I’d look elsewhere.